Breeding American Pit Bull Terriers since 1977 for Beauty, Temperament, and Intelligence. Puppies available most of the time. Ancestors pictured in The Working Pit Bull by Dianne Jessup. Welcome to York Kennels. Thanks for taking the time to stop in and visit. I’m Ginny York, owner of York Kennels in Amherst, Virginia. 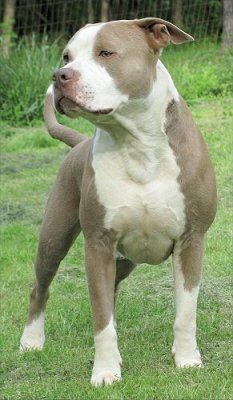 I’ve been breeding American Pit Bull Terriers since 1977, and my UKC registered dogs are carefully bred for their beauty, temperament, and intelligence. At York Kennels, I produce happy, home-raised and well-socialized American Pit Bull Terriers from established, healthy bloodlines. An American Pit Bull Terrier puppy isn’t just a purchase, but an addition to your family. Dogs from York Kennels, will quickly become a cherished part of your household and will also serve as loving companions for children, and other animals. As a responsible, and trustworthy breeder with decades of experience, I’m highly attentive to the needs of both my customers and my animals. I feel that a dog is a lifelong commitment, and I will be here for you at any time. If you’re seeking an American Pit Bull Terrier puppy or dog with specific physical characteristics, contact me. Throughout the years, I’ve offered dogs in various color combinations, including black, blue, champagne, chocolate and red, all with flashy white markings. They also come in brindle and whites in those colors. My American Pit Bull Terrier puppies can be shipped nationwide, but I do prefer that customers come to York Kennels to pick up a puppy in person. Take a look at our currently available puppies and young adult dogs online now. To learn more about how York Kennels can help you find your new best friend, call me today at 434-922-7714 or send me an email at puppygirl999@hotmail.com or yorkkennels88@hotmail.com. I'll be happy to answer all your questions.